There's a chance of thunderstorms everywhere I want to go tomorrow, starting in Moline, IL, where I take off for the NMA reunion, Atlanta, GA, where I change flights, and Norfolk, VA, my destination. I find this nerve-wracking, all these 30% chances of flight-canceling weather. On the other hand, storm warnings on the Weather Channel are like Breaking News on CNN; they gotta have something to scare up your attention. When you think about it, another way to say "30% chance of thunderstorms" would be "thunderstorms are unlikely, so have a nice day." I talked to NMA President Terry Chesson on the phone. He says that room reservations at the Holiday Inn are going extremely well. 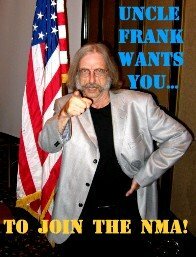 Combine this with the fact that every day, new members are listed on the front page of NMA website, and, as I've been hoping, the 2013 NMA reunion is shaping up to be a mega-blast. Sorry to see that Frank Bartley has had to cancel. Frank is an excellent bass player who knows most of the tunes and can fake the rest; in fact, that's probably why he was offered a last-minute can't-turn-it-down gig that conflicts with the reunion. As always, I'll start off the reunion doing my carpal-tunnel best as a bassist for a few sets, but after that, the members of the Senior Bass Clef Brigade will have to step forward. Rabbit, you coming, I hope?